I have known the eco-friendly folks at NewGrass® for about a year and one thing that has always impressed me is their reliability. If ever I have a question, they reply quickly and have an endearing way of making me feel that they really care about what I need. Maybe it's because these green living folks are old school. The team at NewGrass® has more than 30 years of combined experience in the artificial grass industry and they've been selling and installing synthetic grass since 1997. When I say the folks at NewGrass® are old school, I mean they know what it takes to earn the ongoing respect of their customers and partners. You feel this in every interaction with this eco friendly business which is committed to green in more ways than one. 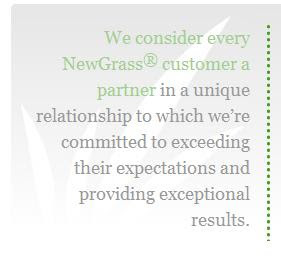 NewGrass® is equally dedicated to their products, their people, their results ... and their customers. From homeowners to Hollywood , consumers and distributors alike are turning to NewGrass® for the best eco-friendly, synthetic grass and turf lawn product ever made. 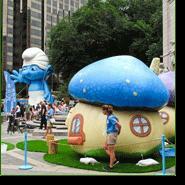 Recently, NewGrass® was selected for the July "larger than life" promotion of the The Smurfs Movie in Columbus Circle outside Central Park in New York City. The event featured a complete Smurf village, with eco-friendly NewGrass® as part of the scene and stars such as Neil Patrick Harris, Hank Azaria and Jayma Mays joining in with their blue friends. NewGrass® was selected for the event because their products are eco-friendly, child safe and ideal for events ranging from The Grammys in Hollywood to a pop-up park in Times Square. “We are extremely excited to be part of Smurfs Week in New York City. Our experience with larger than life events such as the Grammy Awards and The Super Bowl allow organizers to create beautiful, green spaces in any setting,” said NewGrass® President Greg Goehner. I can totally see why NewGrass® eco-friendly synthetic grass is used in parks, schools, backyards and playgrounds, and why earlier in 2011 NewGrass® was selected by the NFL and Gatorade for the Super Bowl NFL Junior Training Camp. NewGrass® looks just like real grass and is totally safe for pets, kids and our environment. In these days of water conservation, NewGrass® is a perfect green living solution! * Totally recyclable: NewGrass® is made with renewable and recycled resources and is 100% recyclable. * The NewGrass® Carbon-Offset Pledge – A portion of each sale supports the Carbon Fund, a non-profit organization leading the fight against global-warming climate change. * The NewGrass® Remove & Recycle Pledge – They will remove your NewGrass® free of charge for recycling at the end of it's useful life. How cool is that? NewGrass® has a 10 year warranty. * No watering needed. NewGrass® will curb water your water consumption regardless of your local weather conditions. It helps preserve a precious commodity … and lowers your water bill. * No weed killers required, because you simply don’t have any weeds. * No aggravating and potentially dangerous allergens that are normally hosted by weeds and, for some sufferers, occur in some natural grasses. Disclosure: I received a sample of NewGrass for review which I am going to use in my daughter's new outdoor themed bedroom. This blog has nice information I really like it. Thanks for sharing.